Kamala Harris got shut down after asking an incredibly important question. Again. 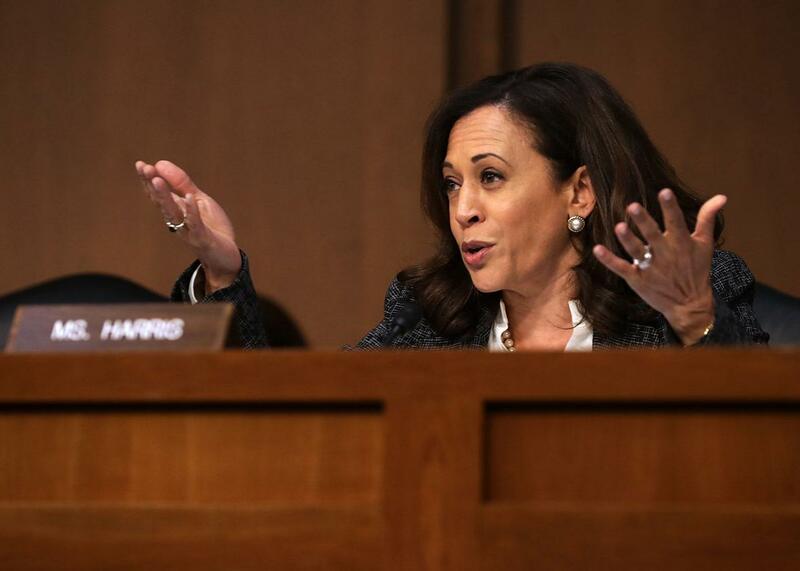 Sen. Kamala Harris attempts to question former FBI Director James Comey during a hearing of the Senate Intelligence Committee on Capitol Hill on June 8. Last week, when deputy attorney general Rod Rosenstein repeatedly refused to answer a question from Sen. Kamala Harris, both Sens. Richard Burr and John McCain essentially shushed her. As my Slate colleague Christina Cauterucci noted of the Twitter reaction at the time, “two long-serving white male legislators working together to stop a new female senator of color from getting an answer to a simple question was not a good look.” On Tuesday, attorney general Jeff Sessions also tried to filibuster the former California attorney general’s questions without properly answering them. And again, the same two white male Senators essentially shushed her. Most importantly, yet again, the substance of what Harris was asking was incredibly important. Last week, she was trying to get a “yes or no” answer from Rosenstein on whether he’d reinstate a Bush-era special prosecutor policy that would ensure that President Trump couldn’t fire special counsel Robert Mueller. Rosenstein repeatedly refused to answer “yes or no,” and when Harris pressed him that is when her fellow senators shut her up. Harris: You referred to a longstanding DOJ policy, can you tell us what policy it is that you’re talking about? Sessions: Well, I think most cabinet people as the witnesses you had before you earlier, those individuals declined to comment because we’re all about conversations with the president. Harris: Sir, I’m just asking you about the DOJ policy you referred to. Sessions: The policy that goes beyond just the attorney general. Harris: So did you not consult it before you came before this committee knowing we would ask you questions about it? Sessions: I’m not able to answer the question. Harris: When you knew that you would be asked these questions and you would rely on this policy, did you not ask your staff to show you the policy that would be the basis for refusing to answer the majority of the questions that have been asked of you. McCain: The attorney general should be allowed to answer the questions. Burr: Senators will allow the chair to control the hearing. Sen. Harris let him answer. Sessions: We talked about it. And we talked about the real principle that is at stake is one that I have some appreciation for as having spent 15 years in the department of justice, 12 as United States attorney. And that principle is that the Constitution provides the head of the executive branch certain privileges. And that members—one of them is confidentiality of communications. And it is improper for agents of any of the department of any departments in the executive branch to waive that privilege without a clear approval of the president. Harris: Mr. Sessions, I asked for a yes or no. Sessions: So the answer is, yes, I consulted. Harris: Did you ask staff to see the policy? Burr: The senator’s time has expired. It should be noted that Harris did get Sessions on the record stating that he had consulted the policy and that it is a real thing and not just something he made up. He was asked to produce this policy. Now he will hopefully have to do so. If it’s just executive privilege by another name, then maybe that can also be challenged in court. And if we do ever get an answer to any of those questions, it will be thanks in part to Harris’ doggedness.